DVB-C Modulator & IPTV Encoder with 8 HDMI Inputs, with Multiplexer, with IP (SPTS or MPTS) Output, with ASI Input & Output. ⟩⟩⟩ 5. Generation BLANKOM® IPTV Headend Technology. A versatile multipurpose encoder/modulator with DVB-C, IPTV and ASI output. 8 HDMI outputs can be modulated into DVB-C and ASI signals and at the same time encoded into SPTS IPTV streams. The internal multiplexer enables to generate 2 DVB-C (or 4 DVB-C optional), 8 SPTS (or 4 MPTS optional) and dual ASI transport streams as any combination of 8 HDMI and ASI input signals. 8 HDMI inputs DVB-C Modulator and IPTV Encoder in one unit. ASI input and output also available. 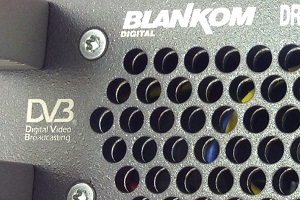 BLANKOM EMU 8608C is a DVB-C Modulator and IPTV Encoder in one unit. It is a professional HD audio & video encoding and multiplexing device. It has 8 HDMI video input interfaces, supporting MPEG4 AVC/H.264 video and MPEG 1 Layer 2 audio encoding. This device can simultaneously encode 8 HDMI HD audio & video sources. It generates 2/4 multiplexes out of the HDMI input sources and the content of the ASI input transport stream. Those multiplexed streams are modulated into DVB-C and also available as SPTS/MPTS IP streams and ASI stream at the output. In conclusion, its high integrated and cost effective design makes the device widely used in varieties of digital distribution systems such as cable TV and IPTV digital head-end, satellite digital TV broadcasting etc. DVB-C modulator for 8 HDMI signals. IPTV encoder for 8 HDMI signals with IPTV output. Multiplexer with 8 HDMI inputs, ASI and MPTS IP output.